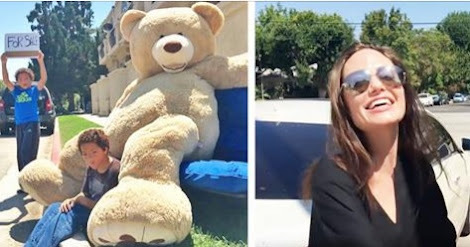 On Sunday, Angelina Jolie Pitt purchased an 8 1/2-foot teddy bear, called "Big Bear," from a few children selling it on the street. The whole encounter couldn't have been sweeter. According to TMZ, the two twin boys, both 8 years old, were selling the bear for $50 on the side of the road in Toluca Lake, California. However, no one stopped. Nobody appeared to care. Then suddenly a white cadillac pulled over and out popped Angie and her daughter Shiloh. Angie handed $50 to each of the young entrepreneurs, doubling their asking price and subsequently making their day. You can see their reactions in the video below.